The first color poster was printed in France in 1869 by the father of poster art, Jules Cheret. Joined by other French artists, the use of posters became widespread, first in Paris, then throughout Europe .They were placed on buildings, railway stations, kiosks, fences - anywhere a large surface was available for the public to see. They were printed on a very thin paper stock, similar to newsprint; truly ephemeral pieces of paper. They were pasted over, torn down and discarded when the event or campaign ended. It is a testament to their beauty, interest and cultural value that some few survived. Throughout the periods of poster production collectors obtained the latest designs by bribing the workers pasting up the posters, tearing the posters off a wall, or by purchasing them from the publisher or specialty shops. Collecting as a passion or hobby has gone through several periods of intense interest. During the "poster craze" of the 1890's large private collections were assembled in Europe and the US. Today, people all over the world are collecting vintage posters and displaying them in their homes and offices. Corporations are buying back posters they once discarded. Museums are discovering posters in their dusty storerooms and putting them on display. These activities and the last 30 years of ever-increasing interest confirm that posters are gaining recognition not only as wonderful decorative objects, but also as important artistic and cultural artifacts. Although lithography was invented in 1798, it was at first too slow and expensive for poster production. 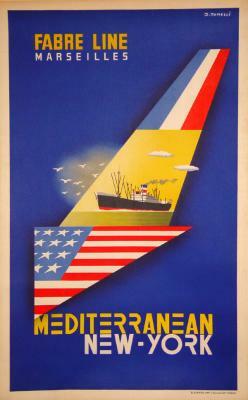 Most posters were woodblocks or metal engravings with little color or design. This all changed with Cheret’s "three stone lithographic process," a breakthrough which allowed artists to achieve every color in the rainbow with as little as three stones - usually red, yellow and blue - printed in careful registration. Artists could now draw directly onto the lithographic stone, producing images of great expressiveness and freedom of line, and the process was cheaper than etching. Lithographs are drawn with a greasy crayon on a prepared Kelheim stone (though due to the increasing rarity of this dense limestone, prepared plates of zinc or aluminium can be used instead). The stone is treated with nitric acid and water, and then gum arabic is applied. When the stone is dampened with water, ink will only adhere to the design. The inked stone and paper are then run through a printing press and the design is transferred onto the paper. Colour or chromolithographs are produced using a different stone for each colour. Printing techniques continued to develop beyond WWII. Due to their greater efficiency, offset and silk-screen printing replaced stone lithography as the main method of creating posters. Offset printing is a process where the printing is first done on the rubber surface of a rotating cylinder (the use of offset printing for movie posters was first undertaken by Morgan Litho in the 1930's). The impression is transferred to paper by the pressure of other cylinders. The term offset describes the printing, or offsetting, of the ink from the rubber. This process was more economical, and the offset plates were easier to handle and store. However, although some early examples were able to duplicate the full color of stone lithography, posters began to lose their color depth and subtleties as the offset printing process evolved .Most of the materials printed today by studios are accomplished using this offset printing process, which has been further advanced through the use of computer technology. Today's posters are more defined and detailed, but many collectors do not feel that they can match the lushness of color and tone that the early stone litho posters were known for. On the whole vintage posters are fairly safe investments, they tend to appreciate steadily in value because there are only a limited number in existence and a growing public interest in them. The contributing factors to the value of a poster are its condition, the printing method (i.e. lithograph or offset), its rarity, the artist and, most importantly, the image itself. While there are famous artists like Toulouse Lautrec , Leonetto Capiello or Paul Henry whose work can command high prices there are also many anonymous masterpieces. Above all, you should trust your instinct and buy a poster that you genuinely love and then you know it will be appreciated. With archival mounting the poster is adhered to acid free paper using wheat paste and then attached to linen backing. This process protects the poster and maintains its condition. A linen backed poster can be hung directly onto your wall. If, however, you would really like to showcase your poster we would recommend framing.